Up until now, using secure environment variables for private projects was not the most pleasant experience. This was due to our command line client not being able to talk to Travis Pro. We are happy to announce that this has been fixed. Not by hacking something into the old client, which was more or less just a collection of Thor scripts, but by completely rewriting it. Right now the new client doesn’t do that much more besides encrypting things, but we hope that this will change in the future. 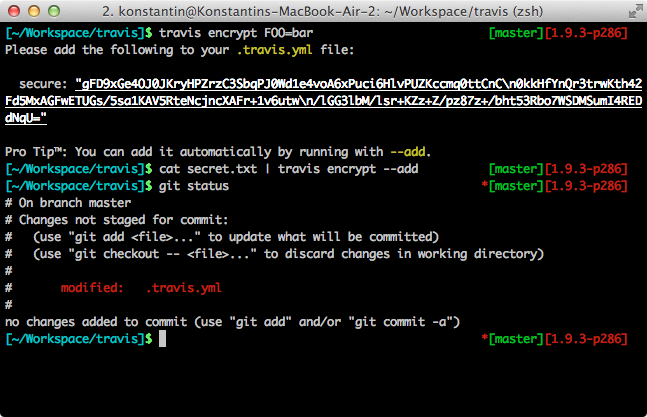 If you’re in your projects directory (or a sub directory), you can simply run encrypt with the string you want encrypted. Some fancy features include piping into encrypt (handy for encrypting deploy keys etc) and using --add to automatically add it to your .travis.yml. The new client ships with a Ruby library it uses internally. We want the Ruby library to reach 100% coverage of our API. Thus anything the web front end can do - and potentially more - will in the future be possible with this library. We would also love to add more functionality to the command line client, check out our TODO list to see what we have planned. Needless to say, this client is fully open source, so any contributions are very much welcome! PS: It also runs on Windows!